Be sure to click on Tremont Elementary School to find what our media center has to offer. Borrow ebooks and audiobooks from our school using your district login to access. Access to these databases is password protected when at home. Please see your media specialist for assistance. Research resources for students in grades K-5. Research database for early elementary students. Sections include Animals, Science, Biographies, Social Studies and Dinosaurs. Research database for upper elementary students. Sections include States, Science, American Indians and Social Studies. (from INFOhio.org) Online encyclopedia for students in grades K-2. (from INFOhio.org) Online encyclopedia for students in grades 3-5. Online encyclopedia for students in grades K-5. 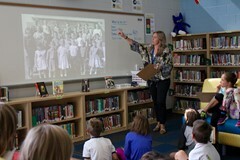 Online database of over 3 million images that are safe and appropriate for school projects for students in grades K-5. Animated educational site featuring movies, quizzes, and other interactive games in all subject areas for early elementary students. Animated educational site featuring movies, quizzes, and other interactive games in all subject areas for upper elementary students. Online magazines, newspaper articles, research databases. Resources can be sorted by reading level for students in grades K-5. Digital reading database including animated talking picture books, fiction and nonfiction books, videos, graphic novels and math stories (Tumblebooks). With a library card, students can access the public library's online research databases from home or school. With a library card and email, students can reserve materials online and download ebooks. This subscription site will help you create a bibliography or works cited page, and is used by all schools in Upper Arlington City Schools K-12. See your media specialist for more information. Media Literacy is the ability to access, interpret, evaluate and communicate information delivered in a variety of medium formats. Website with a wide variety of resources for parents, educators, and students K-12 helping kids to safely navigate the world of media and technology. Canada's Centre for Digital and Media Literacy provides resources to help young people develop critical thinking skills and to engage with media as active and informed digital citizens. Online database of over 3 million images that are safe and appropriate for school projects for students in grades K-5. Password protected when at home, see your media specialist for assistance. Copyright-friendly free images for educational use. When using an image on a web page the image must include this link "Image Provided by Classroom Clipart" or "Clipart provided by Classroom Clipart." View the art of over 8,000 artists. Cool kid activities and projects from the National Gallery of Art. Masterpieces of American Art with innovative lesson plans focusing on social studies and visual literacy. An elementary researcher-friendly section of Britannica School, perfect for learning about famous and influential people. Detailed biography database for upper elementary students. Password protected when at home, see your media specialist for assistance. A great site with detailed information about famous Ohioans. Early elementary research database including a biography section. Password protected when at home, see your media specialist for assistance. A fun, interactive site for the popular Who Was? book series. Coding tutorials, games, printable and challenges for beginners and those who know some coding. K-2 friendly web and app-based coding site. Free programming resource and online community from MIT. You can use tutorial or create on your own. This fun site from the BBC teaches children correct keyboarding skills. Math games, flashcards and a homework helper. Kindergarten through eighth-grade math problems. This site will help you do many different kinds of unit conversions. A nifty site that uses building bricks to teach multiplication. A fun counting game from the commercial site PrimaryGames. A variety of math games and video clips. Can you find 10 hidden bones in the 100's chart? Use this noisy site for number identification. Visit the Columbus Symphony to learn about our local orchestra, musicians, special events and participate in student challenges. View performances and informational videos from Philharmonia Orchestra in London, UK. This wonderful site has top-quality, reliable information, games and quizzes for many health and nutrition topics. Information for kids, teen, parents and teachers. An excellent site created by the Library of Congress. Another wonderful site created by the Library of Congress. Look at primary sources from our nation's past. Click on "index" to see the list of eyewitness accounts from many different time periods. Students will need their UA Public Library card number to access this terrific site. Features photos, recipes, customs, lifestyle, and government info for 190 countries - plus a Kids Edition and a States Edition. A kid-friendly commercial site with information about Japanese culture. An online video game developed by OSU and the Ohio Council on Economic Education. This site, designed for home-schooled children, contains some excellent links for showing factors of production. A terrific list of children's trade books with economic connections. Searchable by economic concept and lexile. Election focused resource to help kids understand presidential elections. A U.S. Government website for children. Interactive presentations, games and quizzes about the history of the federal government. From the Dirksen Congressional Center (updated 2008). Resources for civics education for grade 5 and up. Includes podcasts, lesson plans, timelines and videos on the Constitution and branches of government. An excellent site that was developed with a grant from the Institute of Museum and Library Services. Brief biographical information about some explorers. A terrific commercial site from Scholastic. Read and hear the true stories of both recent and past immigrants. See if your ancestors came through Ellis Island! Games, puzzles and other geography printables. This web site links to All About the United States. Sometimes the Mac versions will not automatically pop up. Look at the top of the window and find "Mac Users - If games are not working, click here". This web site links to world Geography Games. Sometimes the Mac version will not automatically pop up. Look at the top of the window and find "Mac Users - If games are not working, click here." An online encyclopedia from the Ohio Historical Society covering Ohio's natural, prehistory and history. Learn about programming and exhibits at the Ohio History Center. An online collection of primary sources about Ohio History. An interactive site about Ohio's prehistoric people and their flint artifacts. The State of Ohio's government website. Facts about the United States from the Internet Public Library. The official website for the City of Upper Arlington. Terrific primary documents from Upper Arlington's past. Welcome to the website for exploring communities. Includes classroom and online activities. Excellent videos featuring Columbus neighborhoods such as Franklinton, Downtown Columbus and German Village. Columbus Memory is a collaborative project between the Columbus Metropolitan Library and the Columbus Historical Society providing access to thousands of images, primary documents, maps and artifacts about Columbus, Ohio. An excellent site created by the Colonial Williamsburg Foundation. Click on "Kid Zone" for quality information about Colonial life. An online game from PBS about the U.S. Revolutionary War. A great site from the Franklin Institute Online. A commercial site with an online quiz. Printables and games related to United States symbols.